Do you experience eye fatigue while working at your computer or in your office setting? Are your progressive lenses no longer working properly at your work station? If you spend the majority of your day in front of a computer or a work station, we have lenses designed to help make your work day much easier and productive with less neck strain. There are many options available for your prescription lenses which you may choose to help with your vision. Crizal anti-reflection; Eliminates 99% of reflections on the lens surface. It also has a SPF 25 on the back surface of the lens. These lenses are designed to quickly adapt from clear indoors to fully dark in the brightest sun, offering a distinct advantage over regular clear lenses. They continuously adapt to changing light so they're always exactly the shade you need them to be. Transition Vantage lenses don't just adapt to changing light, they also polarize as they darken. Outdoors, the polarization adjusts to match the level of outdoor glare, which can vary as the day progresses and conditions change. If you are need of contact lenses, we carry all major brands including Alcon, Acuvue, Bausch & Lomb, Biomedic, Biofinity, Ciba & Cooper Vision. 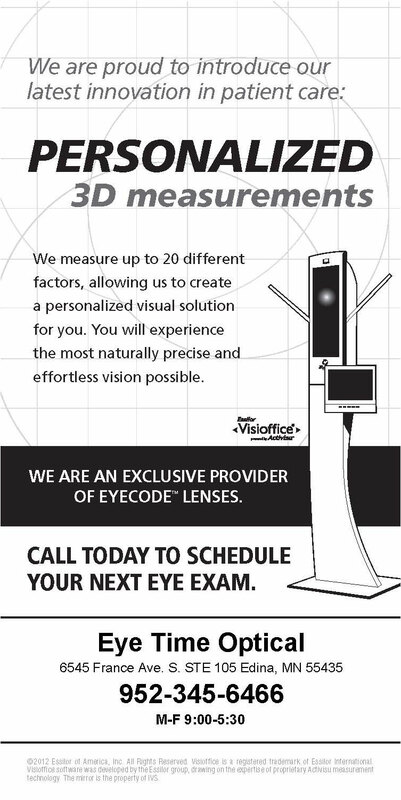 We offer 1 day, toric, monovision, multifocal, CRT-Corneal Refractive Therapy and gas permeable lenses. Schedule an appointment with Dr. Patrick Wands for a complete contact lens evaluation to determine which lens will suit your specific needs and lifestyle. Our prices are very competitive.